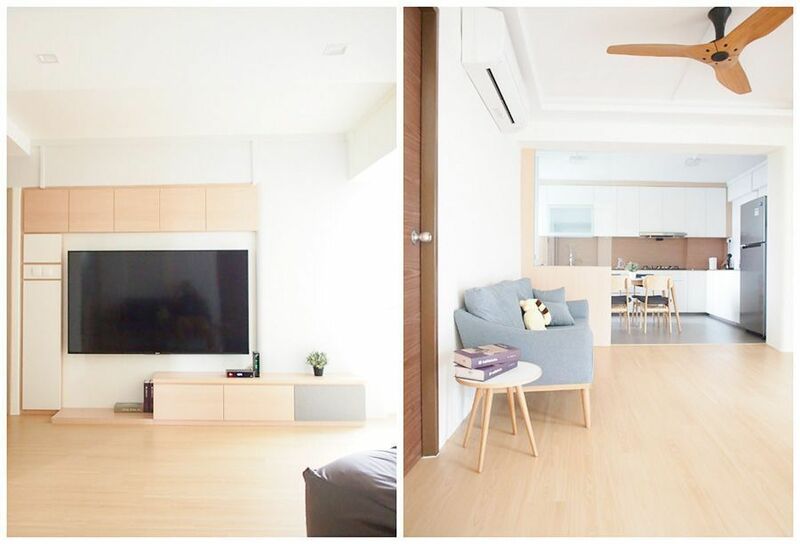 Take a look at this spacious 5 room resale flat in Choa Chu Kang that was given a new life by The Minimalist Society. It takes discipline to decorate like the Japanese—to pare down your belongings to the essentials, to quell the urge to fill each nook and corner with unnecessary decorative pieces, to be content with open and airy space. This was what YC and Ling aspired to do for their new home, a 5 room resale flat in Choa Chu Kang. "We wanted a Muji-inspired Japanese minimalist with three dominating colours: light wood, white, and grey," says YC, who works as a business director. "We took references from Japanese websites and Pinterest, and we searched a lot on websites. We also looked around for interior designers." Searching for an interior designer took a long time, the couple realised. The eighth interior designer YC and Ling got to talk to turned out to be their ideal match: Keith Ng of The Minimalist Society. "We came across eight designers. Keith was the eighth. When I saw his work, I saw it was minimalist—a mix of Scandinavian and Muji-style minimalist. He’s very responsive and easygoing." After collaborating with the couple, Keith easily understood what they wanted for their home. "One of the challenges of resale homes—they’re big, right?—is some of the areas are not so well-lit and are a bit dark. We wanted to open up the space, to ensure we bring in maximum light as possible so the whole place would be more vibrant. We had to do some things like hacking some of the walls to bring light," Keith says. The old design of the resale flat. "The house used to be really dark. It's very old," says YC. "What we did was we overhauled the entire thing. We hacked the kitchen and the toilet. We kept the layout open because of the light," YC adds. "There used to be a balcony here with a step-down living room, but we levelled it, so now we have a bigger living room," says YC. True to the couple's instructions, the living room is peppered with their required colours: light-coloured wood, white, and grey. "For the TV console, rather than making the whole thing in the same colour, we added grey laminates. It's more interesting visually," says Keith. Ambient lights were also installed in the living room and the rest of the flat. Keith reasons, "Resale homes are usually bigger, so when it comes to lighting, it’s not so straightforward. We had to think of ways the homeowners can use lights practically. We [added] different lights to make the place feel more cosy." The couple also opted for vinyl flooring. The dining set—table bought from Star Furniture and chairs from Comfort Design—is located within the spacious kitchen. The living room extends far into the area outside the kitchen, separated via a glass-and-wood semi-partition. "They have a big kitchen so we thought of different ways to enhance the space: different configurations, possible partitions. We came up with an open concept, so it's easier for the homeowners to go around as well," says Keith. The kitchen, of course, is the star of this minimalist flat: a vast area made for prepping, cooking, and entertaining. Closed cabinets and minimal decors keep the look clean and uncluttered. The countertop is from KompacPlus. "It’s a very good material. It's very durable and heat-resistant, with properties similar to quartz," says Keith. For the cabinets, Keith used laminates and made sure that their look is consistent with the other cabinets and shelves in the flat. Keith says, "We try to make them thematic throughout the whole flat. There’s uniformity. We transit from kitchen to living room. It has to be consistent, so it's not out of place." Indeed, the bedroom has laminate wardrobes that echo the aesthetics of the entire flat. "These wardrobes had to be customised," says Keith, citing the importance of giving what his clients want. "Different owners want different things. That's why it’s very important that we work together. Sometimes, we may not know what they want. The best homes are those with the homeowners working with the designers together." Earth tones, white, and grey come together in the study. The display cabinet features YC's toy collection and other knickknacks. Study table is from Bo Concept. This resale flat, Keith proudly says, is "a collaboration between me and the owners. Renovation is a very important process so you have to go through selection together. We don’t want to impose on the owners." YC admits they're satisfied with how the renovation went. "It’s a very interesting experience. I used to study user experience design, so we had to measure items like how long the toilet bowl is, Keith would do mockups, and he would check if the ergonomics is correct. It’s a nice experience to work together, this co-creation." Budget: $120,000 including furniture and electronics. "We wanted to start off with a $50,000 budget, but it’s too ambitious because of the hacking," says YC. 1. Source for furniture before renovating. "What happens usually is you choose your theme, do the renovation, and do the furniture shopping. I suggest you go shopping first, so you roughly know what’s in the market, so you already have something in mind before the renovation. Then you come back to your first theme and then go through the design process." 2. "If you buy a resale flat, factor in at least 20 percent of your house cost for renovations. That’s what you usually need for an old house...unless you don’t mind retrofitting using some of the old stuff. Some people don’t mind using the old kitchen. But for us, we wanted to change the kitchen." Check out locally designed minimalist homes here. For more inspiring designs of minimalist homes, click here. We'd love to feature your home. Email us at hello@cromly.com. Like us on Facebook!